Well J$, you tried. Funk haters gon’ hate. While Mr. Chops efforts are commendable, I prefer to simply let Sir Ear D’Voidoffunk stew in his narrow-minded ignorance. The album is brilliant and spans every genre but country. However, if it is a gateway you want, I still vote for Flashlight. Bootsy Collins can play at my funeral. BTW, I don’t buy Mr. Swole’s “grew up in the white `burbs” explanation. I grew up in the most lilly-white Jewish ‘burb imagineable and that did not get in my way. Pretty sure that some of them RHCP boys may have grown up in similar suburban hamlets but they reached out to Uncle Jam to produce their second album. If funk is or was foisted upon your dad because he grew up on the south side of Chicago in the late 70s and early 80s why is hip hop as big or bigger in the white suburbs as it is in the inner city? 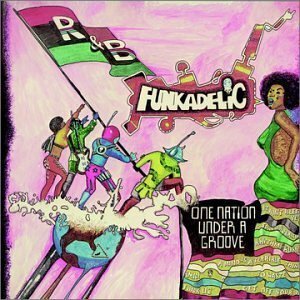 Funk is fun and upbeat. If you really want to be bored by something listen to the endless weltschmerz in the indie-acid stuff you’re addicted to. Tell those kids to stop whining and do something to make the world better. If nothing else funk songs should be appreciated for their great titles and their utility in games of Charades. Try giving someone “Rumpofsteelskin” to act out if you want to make his head spin! Uncle J — don’t be so hard on the boy. His disdain for the funk is, I agree, unacceptable, but some of his indie is damn good. Sleigh Bells makes the world a better place (but uses George Clinton’s beats to do it).